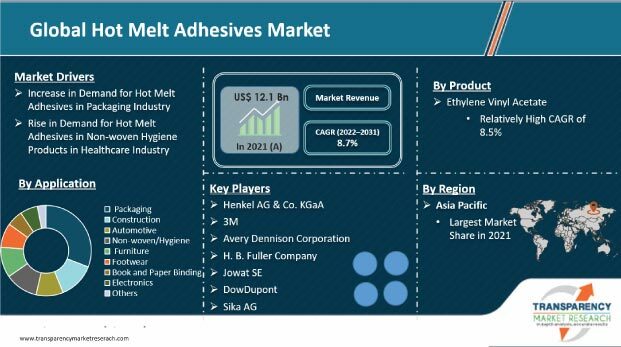 Six major players in the global hot melt adhesives market held a significant share of 75% in recent time, stated Transparency Market Research in a report they published. DOW Coming Corning Corp., Sika AG, Jowat SE, H.B. Fueller, 3M Co., and Henkel are the key companies who have procured a good hold in this market. Most of the companies are trying to tune up their exports for expanding their foothold in other region. Apart from this, advent of middle sized as well small companies are anticipated to lock horns with the major players in order to acquire strong customer base. It is expected that the market is expected to witness an intense competition in future. The global hot melt adhesives market on the basis of product is segregated into poluurethanes, polyamide, styrene block copolymer, and ethylene vinyl acetate. Amongst these, ethylene vinyl is predicted to hold the maximum share during the forecast period due to its high demand than others. Major reason helping this segment to grow is the low price of the product along with it high popularity in the construction and packaging sectors. However, polyurethane is likely to witness a decent increase in share in the years to come. On the basis of geography, Europe holds a lion’s share owing to stable packaging industry. Whereas, Asia Pacific is likely to become the fastest growing market. According to Transparency Market Research, analysts predicted that the global hot melt adhesives market will expand at a CAGR of 5.2% during the forecast period 2016 – 2024. The market which was valued at USS6.0 bn in 2105 is prophesied to have a stellar growth leading it touch US$9.44 bn by the end of the forecast period. The global hot melt adhesives market finds it application in various sector such as packaging, electronics, and construction, these have augmented the sales rate of the market all across the world. Most of the companies in the market have already made their base strong with a firm customer base in both developing as well developed countries. These geographical stretch has fetched the market to grow at a steady CAGR. Apart from these, enhancement in the packaging quality of foods and beverages is contributing a significant share in helping the market to grow. Adhesives products are known to be safe while using it in various conditions along with its environmental friendly nature have attracted many customers, thus bolstering the market. Various governmental agencies are known to support the market to grow due to above mentioned characteristics of the product. This has particularly helped the market to grow in developing countries. However, it has been noticed that as the market have some flaws as well, which are likely to plummet down the revenue generated. Continuous price fluctuation of oil price owing to fickle politics going all across the globe. The uncertain nature of oil industry is also considered as a major hindrance causing factor. Oil is required by the adhesives manufacturers to produce adhesives, however, plunging numbers of war along with rickety situations in Middle East, the oil process are expected to plummet down thus helping the market to flourish again.